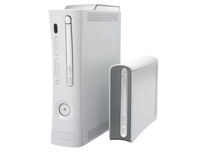 The fate of HD-DVD is not critical to the success of the Xbox 360, according to senior Microsoft officials, who have noted that the company would consider supporting rival technology Blu-ray if it were victorious in the high-definition format war. Following Warner Brothers’ decision to defect from the HD-DVD to the Blu-ray camp last week, Xbox hardware group marketing manager Albert Penello told Reuters, "I fundamentally don't think ... this has a significant impact on Xbox 360 versus PlayStation 3." Penello went on to note that in the previous hardware cycle movie playback capabilities didn’t play a major role in the success of systems. "With the PlayStation 2, DVD was a big part in the beginning, but over time, people were not buying it as a DVD player after first year or two." While Microsoft offers a standalone HD-DVD player Xbox 360 accessory, Sony’s PlayStation 3 comes with an inbuilt Blu-ray player. Penello did add that Microsoft would “have to consider” supporting the Blu-ray format if it emerged victorious, but suggestions continue to grow that Microsoft is far less bothered about the HD format war than initially thought. In a separate interview, Microsoft chairman Bill Gates told USA Today that, in time, most consumers would access movies via direct download rather than from physical discs.